X 17.2 and 10.0 Flares! EIT closeup of X17.2 flare. MPEGs: large, small. QuickTime: low, medium, high quality. X 17.2 + 10.0 Flares! 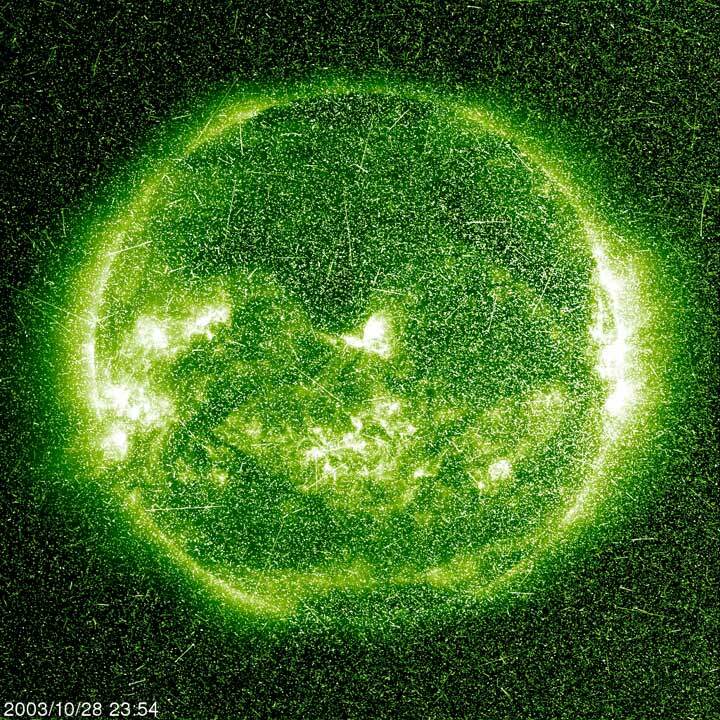 Active region 10486, already under close scrutiny by several instruments on SOHO and other satellites, as well as numerous ground observatories, started up a spectacular two-part show in the morning on Tuesday 28 October 2003. An X 17.2 flare, the second largest flare observed by SOHO, was setting off a strong high energy proton event and a fast-moving Coronal Mass Ejection, hitting Earth early on Wednesday 29 October. The one-two punch was a done deal on Wednesday afternoon, when an X 10.0 flare set off another round of particles and another fast-moving CME. 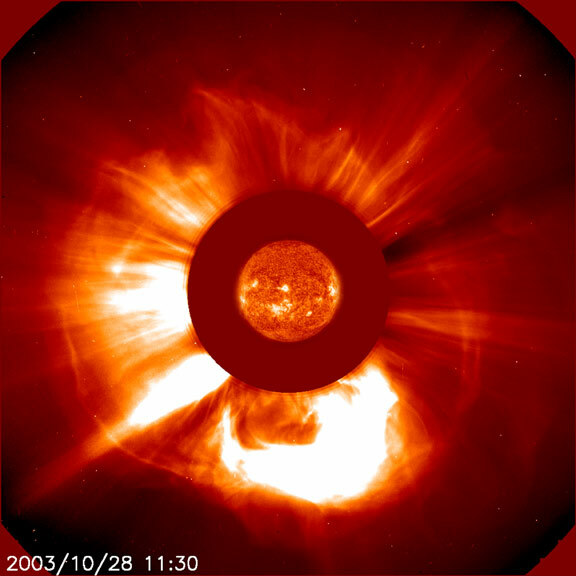 The high level of energetic particles have caused two SOHO instruments to take precautionary measures: Both CDS (Coronal Diagnostic Spectrometer) and UVCS (UltraViolet Coronagraph Spectrometer) have stopped taking science, ramped down their high voltages and turned off the high voltage supply. 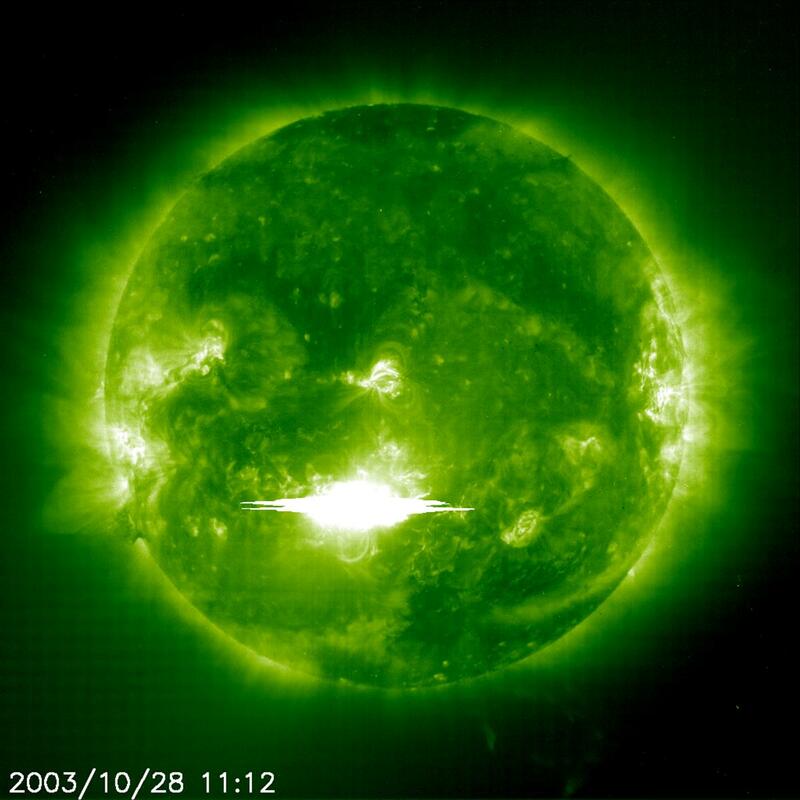 UVCS returned to normal operations briefly on Wednesday, just in time to catch the CME following the second flare, before they had to safe again. Both instruments were back to normal observations by late Thursday. 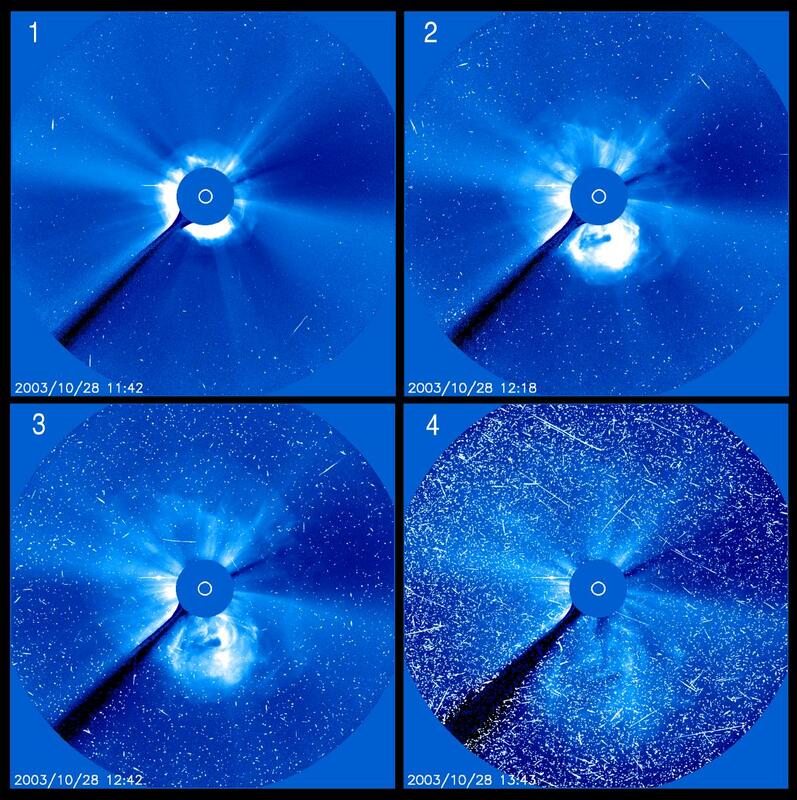 Other instruments are less affected, although the onslaught of particles is quite noticeable for some - they are the cause for the "snowstorm" in EIT and LASCO images. 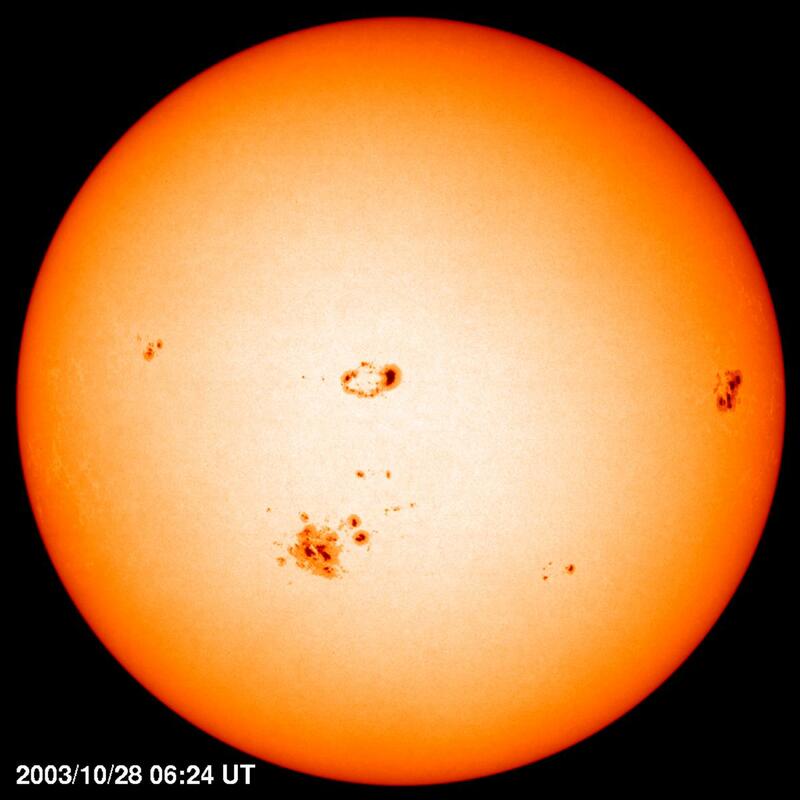 Not only does it make detection of new CMEs difficult, it is also making their on-board compression algorithm less efficient - over time, their observations lag behind the schedule because images take longer to downlink, and their buffer fills up. 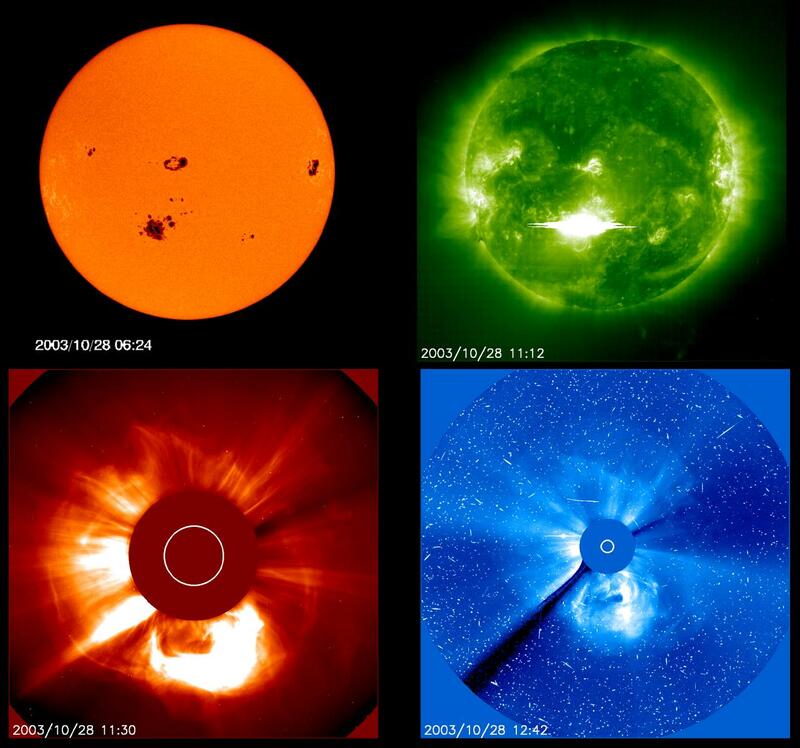 A number of people have noticed that a comet was approaching the Sun shortly before the flare and CME (see the beginning of the LASCO C2 movie above, lower right corner). However, we have no reason to believe there is any connection. Such a comet would evaporate completely before getting anywhere near the surface, and its mass would be like a speck of dust compared to the almost 10 billion tons of matter involved in the CME alone. And the orbit of sungrazing comets (theoretically speaking, should they have survived the encounter) does not touch the Sun itself.